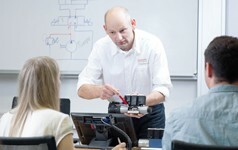 The modular training systems from Bosch Rexroth are perfectly matched to the qualification stages of industrial and educational institutions. All industry-relevant technologies and processes concerning hydraulics, pneumatics, electric drive and control technology, mechatronics and automation are practice-oriented. 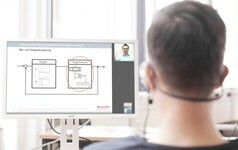 Learning objectives coordinated with the German Federal Institute for Vocational Training (BIBB) have pushed Rexroth to develop and continuously improve the hardware for exercise and project manuals for trainers and trainees. By means of the training systems, inexperienced and experienced users gradually acquire practice-oriented and technical expert knowledge. For different learning topics we offer workstations and device sets with corresponding project manuals with exercises out of the industry. A device set is an assembly of standard industrial components used to carry out practical exercises.